Handknitted chunky mohair cowl in a pale pink/lilac colour. 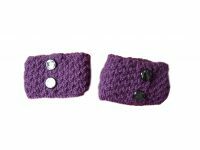 This cowl is very soft to feel and can be worn open or folded over for extra warmth. This cowl comes in a clear lidded perspex box ready for giving as a gift.